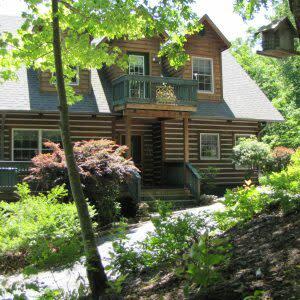 Walk in to Livin’ Lodge and feel the charm of this quintessential log cabin with old style chinking. There are awesome year round mountain views and gorgeous sunsets. 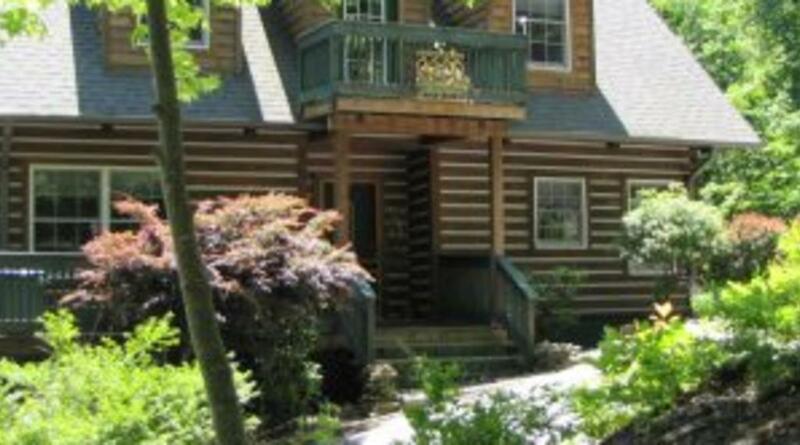 Livin’ Lodge is a gorgeous, 4 bedroom, 3.5 bath home with 2 balconies’ and a main and lower level deck. The kitchen is well stocked, has a high chair for the little one, and features an 11’ long kitchen table. Every meal with family and friends seems like a mountain picnic. The living room is comfortable with 2 couches and chair. Gas log fireplace adds warmth and charm during the cool months. Entertainment provided by a large flat screen TV with Dish Net service, Blue Ray disc player, and WI-FI. A writer’s desk tucked under the staircase has a Bose docking station and is big enough to relax with a book or magazine. There are doors that lead out to the upper deck. The upper deck features propane grill for the grill master, and patio furniture with umbrella. The view is breath taking. The night lights are Forest City, about 26 miles away! Enjoy the sunset and stars in the expansive night sky. Just Awesome! Back inside on the main level is a guest bedroom with a king bed, DVD/CD player, flat screen TV with antennae for local channels only. The kid’s room features 2 single beds with games, puzzles and a window seat. A full bath rounds out this level. Upstairs is master bedroom with king bed, flat screen TV with antennae also. There is a child’s bed nestled into the window dormer. A door leads out to the small balcony. The full master bath is walk-in shower only. Downstairs is the family room with dry bar neatly tucked under the staircase with a shelf. A college fridge and small coffee pot add to this convenience. The family room has flat screen TV with Dish Net service, Blue Ray disc player, and a Wii game system. Doors lead out to the lower deck; relax in the chaise lounge chairs or fall asleep in the hammock. Views are just as good as upper deck. Off the hall is a half bath and the washer and dryer are located in their separate laundry room. The second master bedroom offers 2 double beds, flat screen TV with antennae and DVD player. The master bath consists of jetted tub and a walk-in shower. A door from bedroom leads out to a larger balcony with table and love seat for quiet morning wake up with a hot beverage and a view. Outdoors is a tire swing for the kids and a fire pit. The fire pit is located within the circular driveway with all those stars above. Come and relax at the Livin’ Lodge, connect with nature at its best. You’ll be Livin’ Lodge.